Located just 15-minutes from Cardiff city centre, Cardiff Golf Club makes for the perfect spot for a round of golf when on a city break. First built in 1921, there is a lot of history at Cardiff Golf Club, having changed a lot as the city around it grew, becoming the delightful par-70 it is today. 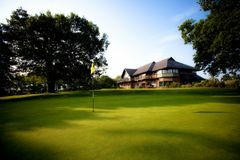 Now, the club is a part of Cardiff itself, although it is surrounded by houses you will feel a million miles away from the hustle and bustle of the city while on the fairways. The course at Cardiff Golf Club is relatively short, 6090-yards from the tips, as it features 6 par-3s, however, with a stream that runs through the course coming into play on many of the holes, it is not as easy as it first appears. Despite being so near the city centre, the course does not feel cramped and provides some beautiful views. The variation of golf holes is excellent, 2 par-4s measure less than 300-yards, however, 4 others measure over 400 so you’ll need every club in the bag to score well.